A femto-fermentation, I submit, is the atomic level for fermentation science. It is performed in a laboratory of the size that will supply all the needs of a household, including generous gift-giving. Let’s get to the point here: it is possible to justify the typical household fermentation activity on economic grounds alone; unless you’re making a hundred bucks an hour. But the real payoff from the femto-fermentation lab comes from the sense of control one has over the ability to produce an altered state of consciousness. It is also a source of humble pride when other people agree that this is a nice way to get there. The following sections provide an explanation of what elements come together to serve the need of the femto-brewer. 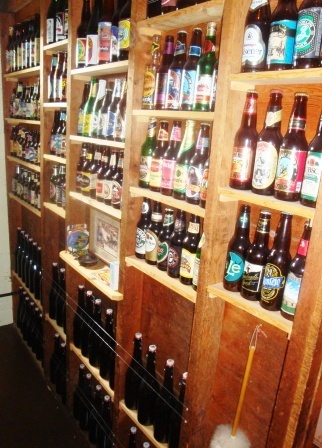 The term “brew” is used in this case to cover the entire range of fermentation experiments be they with grain, sugars, fruits, or grapes. 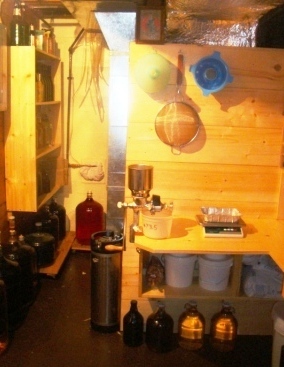 Here is a photo tour of one such femtobrewery, which may provide inspiration for others with similar inclinations. The real heart of the femtobrewery is the stock pot range. I thought about installing a propane burner but I didn’t want a propane tank in a space this small. Browsing restaurant supply web sites I discovered these commercial ranges. This one puts out 50,000 BTU through two concentric burner rings—my home furnace puts out 35,000. 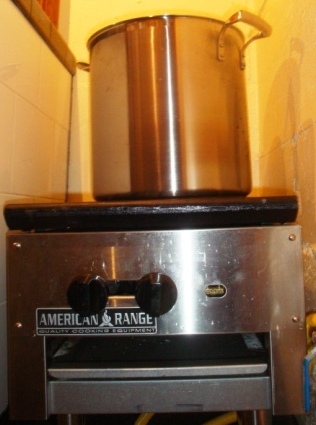 The range can bring 20 liters of water to a boil in less than a half-hour. The boiling vessel is a 32-quart stainless steel stock pot with a layered bottom composed of copper sandwiched between stainless steel. It can also be used for canning fruits and vegetables. Ventilation is extremely important both because the brewery must vent combustion gasses, and the range heats the room by about 20 degrees F when it is boiling wort. I also use a fan in the doorway to push cool air into the room. I had a double laundry sink originally installed in the house in 1952. I’d prefer a stainless steel commercial kitchen sink, and maybe I can afford to change it out some day. In the meantime this provides plenty of capacity for washing bottles and equipment, as well as a bath for cooling hot wort. 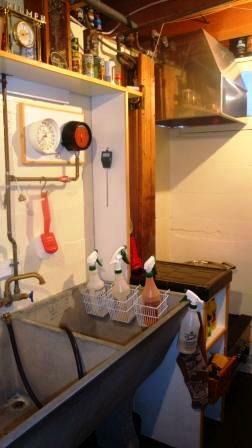 In the winter the cold tap water comes out at around 39 degrees F and cools four gallons of wort in about 30 minutes. 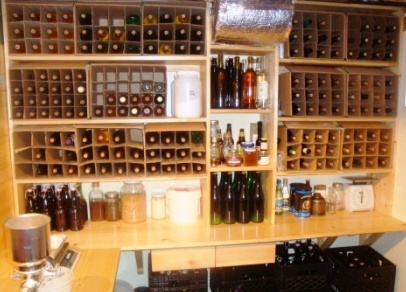 Nice to have everything handy and accessible when contemplating the ingredients for a fermentation experiment. Here are grains, acids, roots, nutrients and a reference library. A triple-beam balance provides laboratory-level accuracy to one-tenth of a gram. This is good for weighing very small amounts of micro-ingredients for creating complex flavor profiles in beverages. Often one or two grams of herbs or acids are sufficient for even an average sized batch. 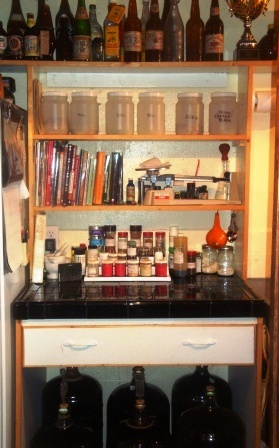 A drawer contains more ingredients and additives, calculator, miscellaneous tools and equipment, historical note books. Below there is room to store six carboys of up to 25 liters in capacity. Specialty grains can be stored in airtight containers to be taken out, weighed and cracked. A Victoria grain mill is excellent for crystal malts and works well for smaller quantities of mashing malts. A portion scale accurate to five grams is fine for weighing out bulk grains. A Grateful Dead mini-poster is totally optional. If the stock pot range is the heart of the femtobrewery the refrigerator is the soul. The freezer is excellent storage for maintaining the fresh flavors of herbs, roots, and berries, and the enzymatic power of grains. A calendar keeps track of dates and events related to brewing projects, and provides a ready location to record notes and thoughts occurring while contemplating current or future projects. An out-of-the-way spot on top holds a dish drainer for air-drying bottling wands, air locks, sampling thief. The real soul, like all souls, however, is on the inside. When the lower shelves and drawers are removed, the main compartment provides for the storage and dispensing of chilled beverages, and is ideal for preservation and long-term storage of highly aged beers. The top shelves remain, and these hold swing-top bottles of unpasteurized soft drinks. It provides a home for a variety of yeast strains for quick reconstitution into starters for batches of specialty beers and wines. 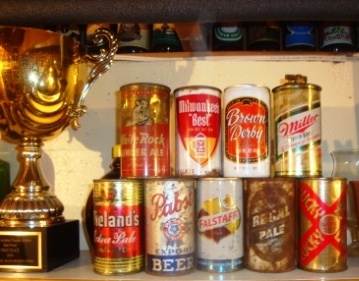 These are kept in a collection of Canadian stubbies from the 1970s. They are shorter than long-necks and will fit on the shelf with a full-size air lock on top. They are also sturdy, as they were manufactured to be refilled many times and have thick walls for that purpose. Beer labels can vary from plain to mildly interesting by themselves. They make an impression though when there are a hundred of them all together. This area can be converted to store home-bottled beer too. The 750 ml bottles are swing-tops from Italian sparkling Prosecco Venuto. They are great for sparking wines, ciders, gruits, etc. 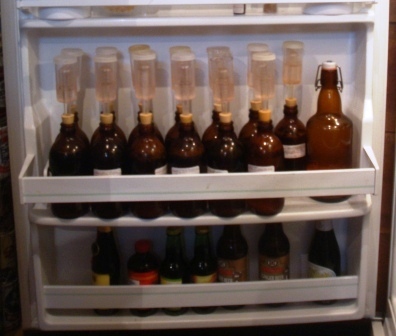 It looks like a lot but if you want to drink a three-month-old beer every day, you need to have three months of beer on hand. Swing-top bottles are great. 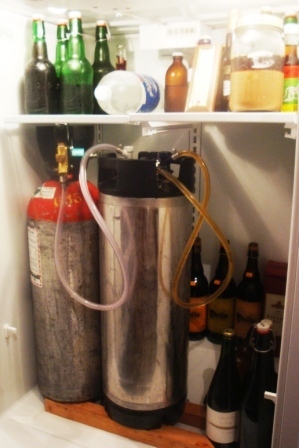 It’s possible to vent out any oxygen by slightly easing the tops and quickly resealing after bottle conditioning. Beer can be kept more than two years this way. Bottles are coded on the stopper, and a code record on a clip board shows the type and bottling dates of the various batches. Twenty-five liter Cambro commercial kitchen containers serve as storage for bulk specialty grains. White wines can benefit from a year in the bottle, reds more than three years. As this is not a temperature-controlled wine cellar, (its average temperature is 60 degrees F) the wines do age rather quickly. But they also tend to be consumed quickly too. Sixteen 24 oz bombers will fit in a standard milk crate. Don’t steal them though, that’s bad karma. There are so many they can be easily obtained just by asking. Why not? If you’ve got a collection this is a nice place to put it. This one dates back as far as a 1976 trip to Ohio where I had a job selling The Family Bible Library door-to-door in the little farm towns of Wood County. I can still remember the taste of most of them. Don’t bother trying the Taiwan Beer in Chiang-kai Shek International Airport. Lion Beer by South African Breweries is pretty good at 10 Rand (~$1.00) in a decent Johannesburg bar. Brahma Chopp is just a cool name. The chicken wire is a tribute to the Blues Brothers’ gig at Bob’s Country Bunker. I had a volunteer job cleaning up old hunting camps in a state park. 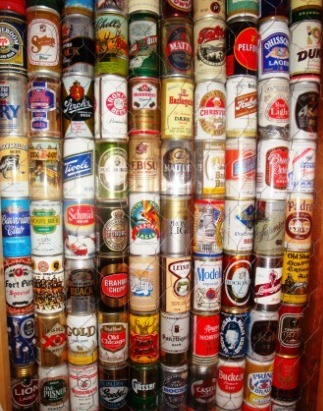 My buddy found some cans in the wall of an old house he was renovating. After a heavy storm in Santa Cruz a can emerged from the back yard midden. I found a 30-year-old can of beer still in a neighborhood grocery cooler in San Francisco. I looked down the chimney of the dugout shack at the Mexican Mine in White Mountains National Forest. That kind of stuff. It’s really nice to have some outside feedback on how you are doing. This is the result of my first year competing with my beers. As it can get expensive at fifty dollars a pop to enter competitions I’ve paused for a while. The large framed picture is a place mat from the now-defunct Maxmillian brew pub in Amsterdam. It describes the brewing process in Dutch, with nice period-type illustrations. There’s also a vintage lemon-crate label from Santa Barbara, and a vintage Dutch beer ad hiding a picture of me disguised as a hippie. At the top it’s “The Qs Brothers” doing a gig at the annual QAD Inc. sales meeting. Contemplating the next brew, or sipping the last one, staring at the wall focuses the mind and provides a sense that it’s not all in vain.